I have been shocked by the amount of people that have found my site due to them searching “Peacock Nursery.” I created this nursery back in November and daily, see the traffic that it has generated. It makes me wonder…are there nurseries out there similar to this board? I’d love to know and see pictures. 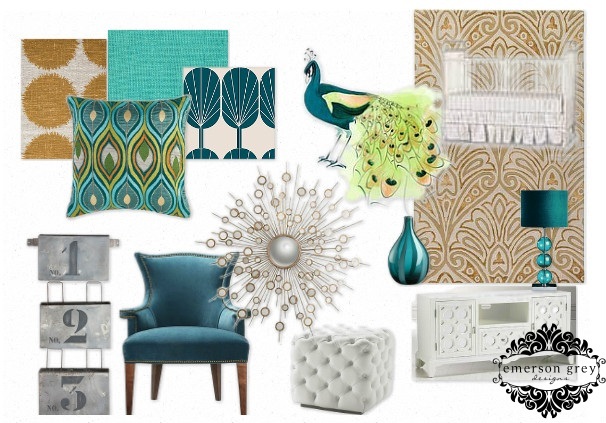 I thought about the peacock ‘theme’ and wanted to show how it can translate to a teens room too. Below I created another space with a bit of peacock elements and colors. I went a softer route this time, pulling in some greys and blue and not so much of the classic peacock blue. There is still a bit of it in the rug and the peacock print. I wanted to introduce some other furniture tones. In this room you see the painted Jenny Lind twin bed, a white weaved hanging chair, wood nightstand and a brass etagere. I love the idea of the etagere. Have you all seen this pin floating around Pinterest? How lovely are those bookshelves? The best part is they are the Vittsjo bookshelf from Ikea and are only $70 and then were spray painted in a brass finish. Love a great DIY. 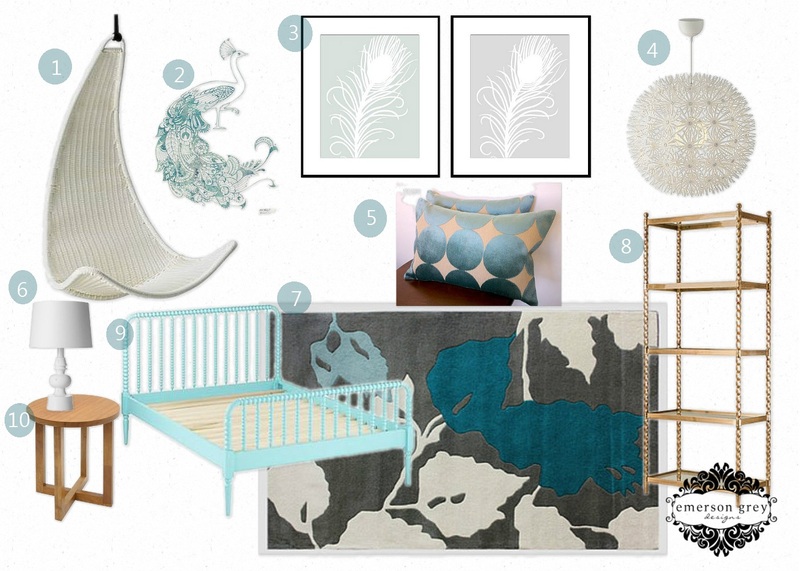 Love the nursery and the teen room! That brass etagere is amazing. I seriously want to put one is my house somewhere!